Our ride from Manchester to Cannes and back took 7 days from the 12 to the 18 June 2005. Myself riding my '97 Blackbird and my friend Carl on his '98 VFR. On Sunday 12th we set off at 12.30pm and rode the 285mls to my sisters in Deal where after a little refreshment in The Port Arms facing Deal beach we spent the night. The next morning (Monday) setting off at 8.30am we headed for the channel tunnel. I think better to book the ticket in advance next time as we were fleeced for �77.00 one way. Leaving the Folkstone side at 9.30am the train journey was fast smooth and hassle free. 25 minute journey, no tie downs to mess with, no problem exiting at at Coquelles (Calais) either. Exiting the station the signs lead us directly onto the A26/E17 towards Reims. The two lane motorways weren't as empty as i'd been lead to believe but they were beautifully smooth with no cats eyes to skip over when changing lanes. I found lane discipline to be excellent, every driver pulling to nearside lane after an overtake to let faster traffic through. Speed limits in good weather are higher than the UK approx 80mph and stop off/rest points every 20kms or so along the motorway helped make the journey fatigue free. We stayed on the A26 as far as Troyes with the total toll fees so far at 16 Euros. Joining the N71 towards Dijon again was hassle free as the road signs here are excellent. The N71 provided much greater veiwing pleasure through open countryside to beautiful rustic villages. After an hour, about 6pm we rolled into an attractive little town called Chatillon-sur-Sienne, and booked ourselves into the charming Hotel Cheval Rouge. 43 Euros for twin a bedded room with secure parking..........and a bar, excellent. Raining this morning. Fuelled up at Chatillon-sur-Sienne at 9.30am and headed off down the N71 towards Dijon, a beautiful road through scenery that reminded me a lot of the Kent countryside only the road is much smoother and straighter. At Dijon we joined the A31 and A6 down to Lyon. The rain is very heavy at times, so our speeds are down to only 50 or 60mph. I realise what a fantastic job my new HJC ac11 helmet is doing of keeping the rain out and staying totally mist free. 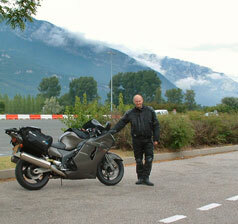 Easily through Lyon and onto the A43 and A48 arriving at Grenoble by 3.30pm. Amazing veiws of the Alps on the way in here on the A48 as it swings down and around to the toll area. We stop to admire the view at the toll area which is flanked either side by these leviathon outcrops. Grenoble was frustratingly busy. Very heavy traffic, queues everywhere and raining again. It took us an hour to filter and paddle our way through the afternoon traffic out of Grenoble and on to the famous N85 or Route de Napoleon toward Grasse. A little tip here, fuel up around Grenoble because the last gas station before the mountain road charges 1.75 euros per litre. The N85 sweeps and climbs steeply almost immediatly. The radios we had came in useful for overtaking slower traffic as we could inform each other when it was clear ahead to overtake. I'm certain that the views here would have been amazing but we could'nt see anything because of the low cloud and very heavy rain. We were going to carry on to Gap but the rain was beating down our enthusiasum and we didn't want to miss the mountain views because of the rain so we stopped at a little place called Corps. The Tilleul Hotel was priced at 41 euros for the twinbedded room with a balcony overlooking the car park and of course mountain scenery. It stopped raining by 5.30pm and the cloud lifted a little raising our hopes for better weather in the morning. There is a church here that chimes (loudly) every quarter of an hour till 9pm.............and then every hour right through the night, don't forget your ear plugs. 279 miles today. Breakfast came to 19 euros for the both of us and consisted of croissants, french bread with jam and honey, fresh orange, a small omelette and a cup of tea. The clouds had lifted and the forecast was excellent as we left at 9.30am. We stayed on the N85 through the Alps. Amazingly scenic, easily comparible to Canada's Rockies. When the road dropped down from the mountains to the valley floor we could really up the pace, 100mph on a single lane carriageway surrounded by mountains. Exhillerating. The view of Gap from 2000ft is superb, dropping down from a winding mountain pass with 10mph hairpin bends, but into the town it's just like any other busy town. Queues of traffic, road works and diversions. There were some beautiful little towns after this though, Sisteron and Castellane spring to mind. After Sisteron the N85 really goes all out to show some fantastic scenery and present the best biking road we have ever been on. A very fast road bordering along a mountain stream, 110mph straights cutting underneath overhanging rock, slam on for the twisty bits and open up again on the long straights flying past the odd car and motorhome. 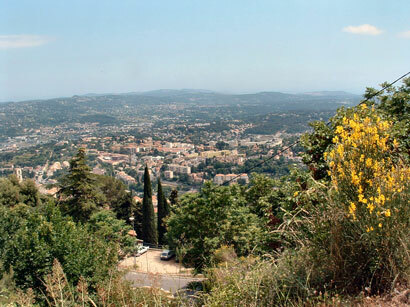 Another stunningly beautiful winding descent overlooking Grasse. As expected though, Grasse was just another traffic filled hot spot. Paddling our way through queues of cars, traffic lights and crazy scooter riders and on to the N1085 to Le Cannet and Cannes. We stopped on the seafront at Cannes admiring the million pound yachts in the harbour wondering which one belonged to Katherine Zeta Jones and whether she would appreciate our achievement enough to invite us onboard for..........................some refreshments? 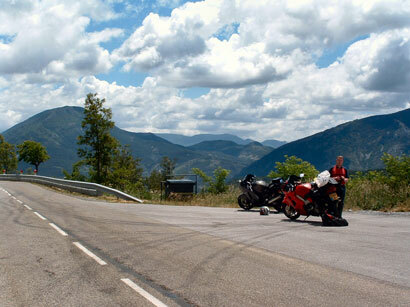 One hotel in Cannes wanted 220 Euros for one night so we headed west along the N98 for about 15miles to La Trayas. Hotel de Charm incorporating restaurant La Marmite offered secure parking, private beach, swimming pool and panoramic views of the med and surrounding coastline for a comparitively respectable 90 euros for a twin bed room. Food and drink here was expensive though at 3.50 euros for a can of heineken or 19 euros for a bottle of wine and about 9 euros for an omelette. We walked east from the hotel for 20 mins to a little cafe on the left for cheaper drink. Total mileage upto now is 1070. Fell asleep last night to the sound of the waves lapping onto the rocks, fantastic. Total bill for the room, last nights meal, 4 beers and breakfast came to 152 euros. We loaded the bikes up at 9am and already the temperature was up to 30 degrees. Plan for today was to get near Lyon by teatime.We backtracked east for about 10 miles to join the A8 towards Aix-en-Provence stopping once to refresh ourselves with the water we bought at Le Trayas. The A8 met the A7 towards Lyon and we stopped again just past Avignon at a service area for refreshments. The weather today was very hot, that didn't bother us at all while we were moving, but it was also extremely windy making overtakes a very hairy experience. At Orange we decided it might be safer to leave the high winds, fast traffic and motorway barriers of the A7 and ride the adjacent N7 for a while. This lead us through the centre of Orange right past the famous Roman Arch De Triomph. After an hour on the N7, back onto the A7 to make swift progress again towards Lyon. Another extremely busy city Lyon, but well signposted for the A6/N6 out of there thankfully. Rolling into Belleville's main street the Rue De La Republique (D37) about 18 miles north of Lyon at 7.30pm we booked into a Logis De France Hotel called L'Ange Couronne, 42 euros for the night and another 300 miles covered. This was quite an exhausting day due to the high temperatures and concentration required to battle the strong winds. On the road again by 9.30 and decided to follow the much more scenic N roads as far as possible. I cannot reccomend enough the N6 from Belleville to Auxerre through the Burgundy region. A fast road passing through the most breathtaking vineyard filled countryside. We couldn't bring ourselves to rejoin the efficient but dull A6 even as early evening was approaching. From Auxerre we joined the N77 towards Troyes still enjoying the impressive scenery. Beautiful smooth road with gentle bends traversing gorgeous countryside and rustic unspoiled hamlets. 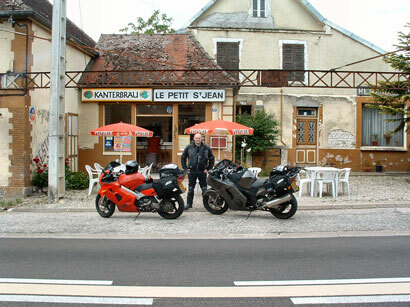 Approaching 3pm we stopped at a little cafe bar called Le petit St Jean where we had 2 teas, 1 ham and 1 camembert sandwhich for 8 euros. total miles upto here was 1583. 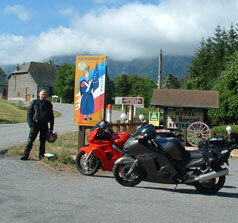 At Troyes we reluctantly joined the A26 and really went for big miles, between 90 and 120mph all the way to Calais. We parked in a busy side street while i went to check hotel prices. Wow, what an eye opener Calais was. When i returned to my bike a couple of thieves were operating independantly right infront of us behind the Holiday Inn hotel, blatently checking cars. One of them moved towards the back of my bike and eyed the soft luggage. I started my bike before getting on in-case i had to wrestle with the guy for my dirty washing (seems absurd now) crammed my gloves inside my jacket, jumped on and rode away without fastening my helmet. I stopped around the corner to correctly fix my kit and we decided to ride a little way out of town to find somewhere a little less busy. On the D227 near Nielles-Les-Ardres we found a chambres hotel called 'Les Hortensias'. These Chambres Hotels are farms that provide fantastic accomodation. Ours was particularly clean, modern and tastefully decorated, en-suite twin bedded and separate from the farmhouse. 45 euros including breakfast. Miles covered today was 480. Breakfast was served at 8am inside the farmhouse and consisted of the usual croisants, bread and jam, fruit juice and tea. Still very nice but i found myself longing for home and a different breakfast, cheese on toast or cereal, or just about anything else. Back into coquelles and on the train by 10.30am French time (1 hour in front). I forgot to book in advance and had to pay 107 euros again. Total miles covered was 2173 in 7 days, averages 310mls per day. I found that at each fuel stop i was putting in about �1.00 more than the vfr.